Those alarmed by the claim (in the title of one recent book) that Star Trek has conquered the world may find this book confirming their fears—or showing just how unlikely they are. 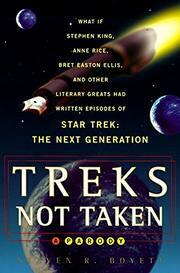 Here we have a collection of Star Trek: The Next Generation parodies written in imitation of well-known authors, from literary classics (Melville, Conrad, Joyce) to modern masters (Heller, Salinger, Vonnegut) and today’s bestsellers (King, Rice, Clancy, Collins). Naturally, the list includes Hemingway and Kerouac, two of the most parodied authors of the century; and Dr. Seuss’s fans have not been shortchanged. While the results are inevitably uneven, there is plenty here to amuse both the Trek watcher and the literary reader—two categories that presumably have a degree of overlap. Boyett manages to walk a fine line between broad and subtle; the Melville parody (“Moby Trek”) opens, “Call me irresponsible”; the Anthony Burgess (“A Clockwork Data”) is salted with pseudo-Russian; and the Ayn Rand (“Fandom Shrugged”) renames the starship the Free Enterprise. And where it must have been tempting to settle for obvious laughs, many of these parodies work on multiple levels: “The Ship Also Rises” copies the style and substance of Hemingway works ranging from “The Snows of Kilimanjaro” to Death in the Afternoon, meanwhile poking fun at the frustration of Patrick Stewart’s stage ambitions in his role as Captain Picard, and fitting both elements into a credible Trek plot line. Boyett’s brief introduction takes an appropriately mock-serious look at the meaning of Trek and at its attraction for the famous writers he parodies (some long dead before the show ever aired, but their submissions were too good to exclude just for that reason). Good fun, especially for readers who get both the literary and Trek references.